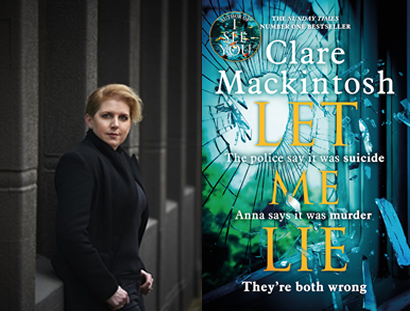 Join us for an evening in the company of number one bestselling crime author Clare Mackintosh as she talks about her stunning, twisty new psychological thriller, Let Me Lie. Clare spent twelve years in the police force, including time on CID, and as a public order commander. She left the police in 2011. Her debut novel, I Let You Go, was the fastest selling title by a new crime writer in 2015. It has sold more than a million copies worldwide. In 2016 Clare received the Theakstons Old Peculier Crime Novel of the Year award. Her second book, I See You, charted at number 1 in the Sunday Times hardback bestseller list in July 2016. We look forward to welcoming Clare to Oswestry the day before publication as part of our ‘Criminally Good’ season of events, celebrating crime writing of the very first order. Clare will be interviewed by fellow crime author, Jenny Blackhurst. NB: To accommodate demand for tickets, this event is now being held at the Wynnstay Hotel, Church Street, Oswestry. Tickets: £6 (£5 redeemable against a signed copy of Let Me Lie). Tickets available from the bookshop, or purchase online (with booking fee).